Election, as a democratic governance tool, is impossible without two things – people and money. Sometimes these things are interconnected. For instance, when labour remuneration of members of election commisions is meant. In the final report, published after the presidential election of May 25, 2014, the OSCE/ODIHR election observation mission states: ‘OSCE/ODIHR observers informed that almost all DECs (district election commissions – auth.) worked independently, in a collegial, transparent and impartial way. In spite of this, the overall impression still is that members of DECs and PECs (precinct election commissions – auth. 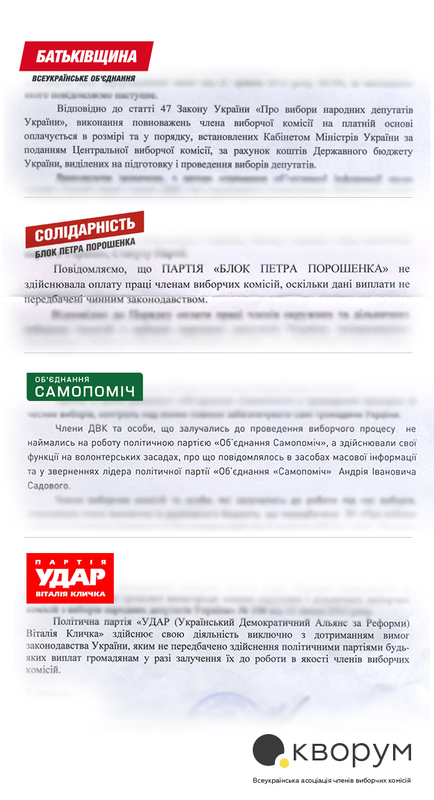 ), nominated by candidates, serve the interests of those candidates, while some interlocutors of the OSCE/ODIHR election observation mission pointed out that in practice labour remuneration for members of election commisions nominated by candidates was expected to be paid by the latter’. One of the organization’s recommendations, respectively, runs as follows: ‘In order to improve perception of impartiality of DECs and PECs, the law must prohibit payments made to members of DECs and PECs by candidates’. That was almost the first time when a reputable international organization possessing an adequate observation methodology and standards, paid attention to two circumstances – the possibility for electoral subjects to pay labour remuneration to members of election commissions and connection between this remuneration and the level of perception of the election commissions’ performance impartiality. 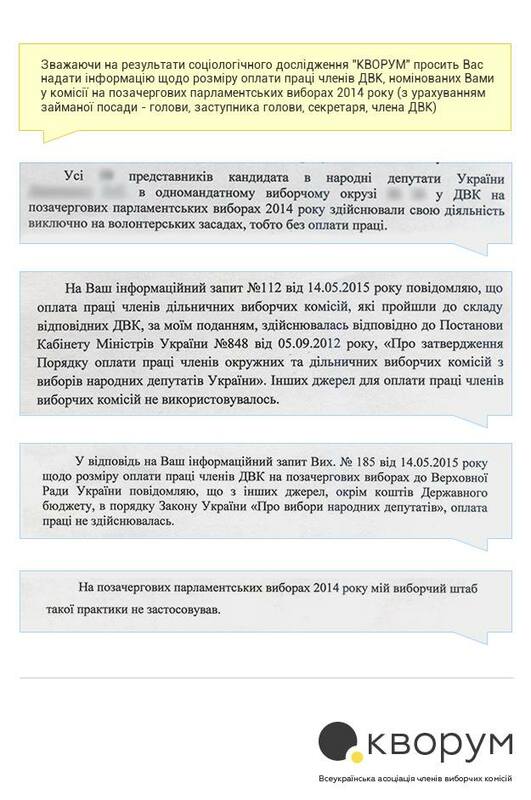 To do justice, it is necessary to point out that already half a year later – after early parliamentary election – that problem was not mentioned in the final report delivered by OSCE/ODIHR. But did this mean that at last-year parliamentary election political parties and candidates did not pay labour remuneration to members of election commissions? The above figures tell us that electoral subjects pay remuneration to members of election commissions – both district and precinct ones. Topic development required giving the floor not just to those who get compensation, but also to those who offer this compensation. In the late May this year MAG ‘CIFRA’ together with the All-Ukrainian Association of Election Commission Members ‘QUORUM’ conducted the respective survey of deputies elected under the majority principle. In reference to the results of sociological studies, the respondents were asked to make public the information on the amounts of compensations paid to members of election commissions depending on the office – head, deputy, secretary, member of the commission. A personal information request was sent to each deputy. Such requests were also sent to each political party that had participated in the 2014 parliamentary election. All in all, 34 responses arrived – 30 from deputies and 4 – from political parties. Most of deputies elected under the majority principle ignored the poll, which is, in fact, also a kind of result. Besides that, a highly illustrative result. The answers received were systematically classified into two groups. The first included those in which it could clearly be seen that members of election commissions nominated by candidated worked on public grounds. The studies and surveys conducted allow making some conclusions. First, members of election commisions in their majority recognize the fact that they are paid by political parties and candidates for their work. Second, one of the most-reputable monitoring organizations of the OSCE/ODIHR paid attention to that fact and recommended introducing legislative ban against the application of such practice. Third, domestic political actors – parties and deputies represented in the VRU – in their majority are not ready for an open talk un the topic of political funding of election commission members. Except for some deputies elected under the majority principle and one political party, all the other respondents who participated in the survey gave just formal answers to the question asked. Fourth, the problem of political funding of election administration is directly related to the problem of ‘dirty’ money in election campaigns. The origin of this money is unknown, and financial reports of electoral subjects do not contain lines entitled ‘labour remuneration paid to members of election commissions’. Fifth, fighting against this practice cannot be limited to respective legislative changes. Efficient campaign against political funding of members of election commisions must presuppose application of a comprehensive approach based on optimization of the system of election administration in Ukraine. In other words, its reform is meant. Further neglecting or underestimating of the above problem will lead to intensification of the negative trends available in the functioning of election commisions: overpolitization, reduced level of professional competence of election commission members, escalation of conflicts in the work of commisions, deteriorating quality of election process organization. In its turn, that will affect the level of public trust in the system of election administration, election process and in the election results.